After finishing a week of Harlequinade with the Pacific Symphony and American Ballet off I went to Atlanta—fearful of travel hassles due to the federal shutdown and possible winter weather. Neither happened and my trusty Yamaha F tuba and I spent a wonderful week with that fine orchestra. Hugh Murphy, my old college roommate, met me and I stayed at his large suburban home the 1st night. His wife Carolyn is a fine artist and I ended up buying one of her watercolors. Mike Moore had been an occasional friend over many years. He got into the Atlanta Symphony 50 years ago when he was only 18—before I taught at the University of Tennessee. He graciously offered to have me stay at his home and we became fast friends over that entire week. I got to know this amazing man and observed his life of service to our music business and to his colleagues. For most of those 50 years he has been a leader in the Atlanta Symphony as an orchestra committee member—but that is only the beginning of his story. He is a true champion in the AF of M and for many years an officer in ICSOM, the national orchestra players association and has participated in union activities and negotiations his entire career helping to steer the path forward for American Orchestras. His kind of leadership and volunteer efforts has made our classical music scene stronger. 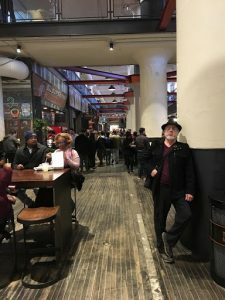 He is also Vice President of the Atlanta Musician’s Union, delegate to the AFM Convention and helped lead the Atlanta Symphony through a difficult lockout and subsequent loss of weeks of work. The orchestra is emerging from those difficulties and has kept its strong musical heritage alive. You would think that after 50 years in one orchestra he would slow down or his playing would suffer—but not Michael. 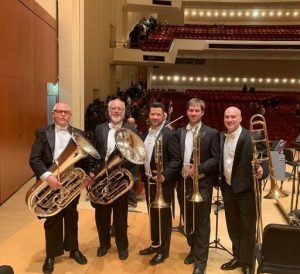 He is one of the strongest and most musical tuba players I know and his orchestra colleagues have great respect for him—I know because many of them told me. I also know because I sat next to him playing that most athletic of all orchestra pieces, Symphony Fantastic. He was rock solid and he made it easy for me to play my part. 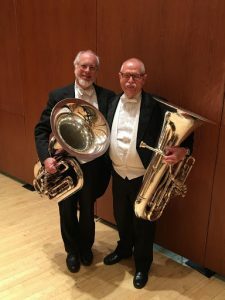 We both played our Yamaha 822 F Tubas and had a mutual understanding of rhythm and pitch—we really played the “Dies Irae” well together. It was FUN. The Atlanta Symphony sounds great under conductor Robert Spano, the acoustics in their hall are excellent and the group is full of strong soloists. What a musical treat for me! Michael does not slow down one bit. He also teaches at several colleges and coaches with the Atlanta Youth Symphony. He leads the Atlanta Brass Society, which performs many concerts, publishes music and makes recordings. Watching him in action amazed me. I like to think of myself as a musician who “gets stuff done” but Mike makes me look like a slacker. Atlanta and the orchestra world are lucky to have his unselfish dedication. Staying at his home was cool too. Mike has built an 8-sided studio in his back yard that he calls the “Octagon”. 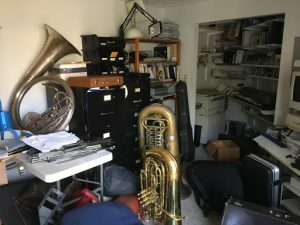 Tuba students all over the south have had lessons there and seen his menagerie of old and new tubas and paraphernalia, his huge library of tuba and chamber music and have enjoyed its good acoustics—and now I have too. If all of these things were not enough he is a big-time Mac computer freak, owns and uses everything from the latest iPhones and computers to an Apple Watch, a house wired for TV, sound and computers and he uses Siri like a full-time assistant. I am also a Mac guy but he opened my eyes so many more uses of that stuff—I am somewhat overwhelmed by it all and probably too old to realize much of it, but will try. He is living that brave new world that our students thrive in. On my last day in Atlanta Mike took me to the Ponce Center, a modern shopping arcade built in the old Sears building. Outside of it was the new elevated urban park. 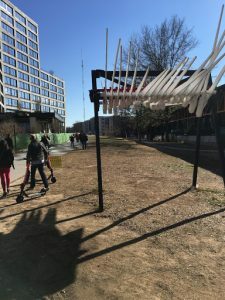 Atlanta is hosting the Super Bowl this year in their new arena and the Atlanta Hartsfield Airport (the world’s busiest) and CNN help make it a world-class city. It’s NOT the sleepy southern town of 50 years ago. It’s a city worthy of a great symphony! Like many of my travel memoirs, I am writing this on the plane back to Los Angeles where later today I have two rehearsals of Scheherazade with the Pacific Symphony. 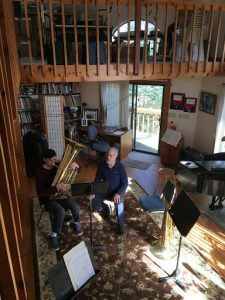 And I am getting ready to release my newest CD, “Flying Circus”, Music for Brass Quintet by Jim Self. It was recorded by me and the finest of Los Angeles’ brass players. The CD and all 8 of my brass quintet compositions will soon be available from Potenza Music. It’s exciting to be living and still making music on a high level. My week with Michael Moore and the Atlanta Symphony is certainly a highlight in my life.